More than 20 crewmembers were evacuated from a 34,500 DWT cargo ship off the coast of Germany on Tuesday after its fertilizer cargo began to overheat, creating a massive plume of hazardous smoke and prompting fears of an explosion. Germany’s Central Command for Maritime Emergencies (CCME) was informed overnight Monday of smoke developing in the hold of the Marshall Islands-flagged MV Purple Beach (aka Amber Lagoon) in the North Sea approximately 30 miles west of Germany’s Helgoland archipelago. MV Purple Beach is a multipurpose container vessel belonging to Hamburg-based Maritime Carrier Shipping. The crew reported that the vessel was carrying a cargo of fertilizer which began to smoke, setting off the shipboard firefighting system and forcing the hold to be sealed off. Officials determined that the plume of smoke was hazardous, leading to the evacuation of all crewmembers early Tuesday. Officials initially established a five-kilometer safety zone around the ship over air quality fears and the potential for explosions. On Wednesday, authorities in Germany were warning residents of some coastal communities to stay indoors and keep windows closed as a precautionary measure after reports of a fertilizer odor in some areas. 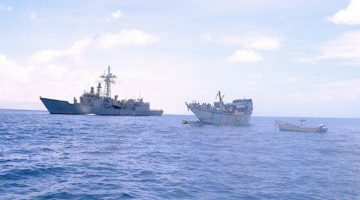 Two emergency response ships, the MV Mellum and MV Neuwerk, eventually moved in to douse the hold with water to curb the amount of smoke emanating from the ship. The firefighting efforts proved successful in reducing the amount of smoke coming from the ship, and officials said there was no longer a risk of explosion. A total of 36 people involved in the response, including crewmembers, were brought to local hospitals for monitoring, but were all later released. The CCME later reported that the vessel had 5,000 tons of fertilizer on board. A total 25 air monitoring stations have been set up along the coast and have shown that there is no risk public health. AIS data showed the MV Purple Beach stopped in the North Sea as of 1600 GMT. The response was continuing as of Wednesday afternoon and involved at least five vessels.